Most anchovies and sardines don’t end up on pizzas. Instead, they go to processing plants where they are turned into pellets to feed farmed fish. Now scientists and entrepreneurs are finding ways to create vegetarian diets for species like trout, which may lessen the strain on over-fished oceans. World demand for seafood is rising, but many of the world’s oceans are already overfished. As a result, fish farming is booming. By 2030 nearly two-thirds of seafood worldwide will be farm-raised, according to a World Bank report issued last month. From the environmental perspective, that is creating a major problem: millions of tons of wild fish like anchovies, sardines and mackerel are being caught in the ocean to feed farm-raised fish like salmon. In many cases, it can take three pounds of wild fish to grow one pound of farmed fish. 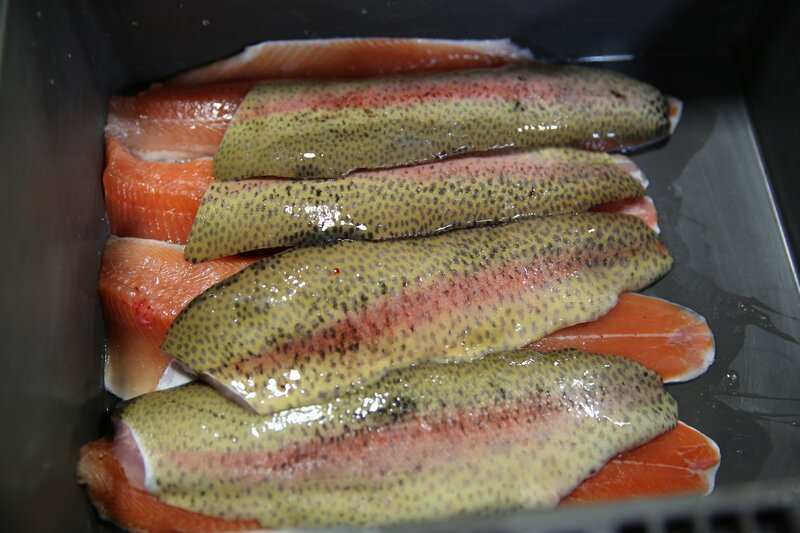 Fillets of TwoXsea’s rainbow trout ready for San Francisco restaurants and grocery stores. Lindsey Hoshaw/QUEST. 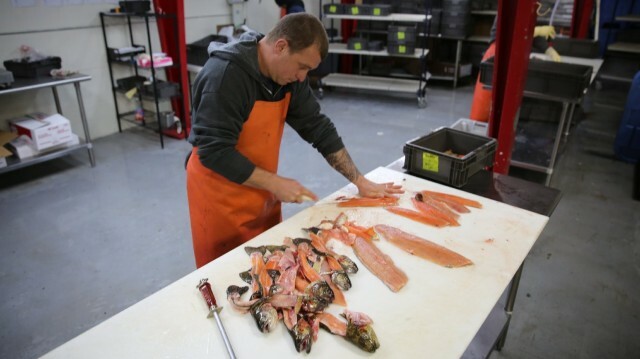 TwoXsea supplies rainbow trout to grocery stores and restaurants in the Bay Area and is the only seafood distributor in the country to raise carnivorous farmed fish on an entirely vegetarian diet. Up to 90 percent of tiny harvested forage fish from the oceans go into pet food, poultry feed and fishmeal, never destined for human consumption. Small, filter feeding fish were traditionally used because they were inexpensive. But as wild fish stocks diminish, the cost of these forage fish increases. Meanwhile, the price for plants like corn and soy has decreased. To avoid using wild fish in farmed fish diets, the United States Department of Agriculture has spent the past ten years researching alternative diets that include plants, animal processing products, insects and single-cell organisms like yeast, bacteria, and algae. The USDA has proven that eight species of carnivorous fish – white sea bass, walleye, rainbow trout, cobia, arctic char, yellowtail, Atlantic salmon and coho salmon – can get enough nutrients from these alternative sources without eating other fish. If widely adopted by the aquaculture industry, this plant-based diet could significantly reduce the amount of wild fish that are harvested and turned into fish meal pellets. The research comes at a pivotal time when a growing population will mean an increased demand for seafood. 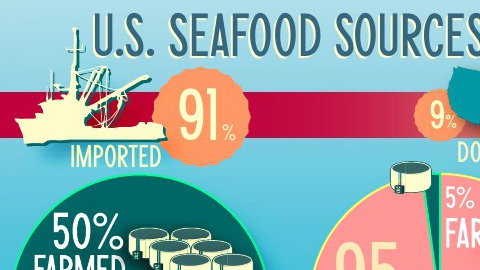 Americans consumed 4.5 billion pounds of seafood in 2012 and to meet that demand, 91 percent of it was imported. Without increased aquaculture production, the world will face a seafood shortage of 50 to 80 million tons by 2030, according to the United Nations Food and Agriculture Organization. But that production needs to be sustainable by decreasing the use of wild fish according to the USDA’s Rick Barrows. “Fish don’t require fishmeal, in fact, it made fish nutritionists lazy,” said Barrows, a Research Physiologist for the USDA. By giving carnivorous farmed fish barley, yeast and soy can we get them to go vegetarian? Click on the infographic above to view a full-size image. Barrows said that fish, like people, don’t need specific foods but rather specific nutrients in order to stay healthy. In fact, all animals essentially need the same forty nutrients—a combination of amino acids, fatty acids, vitamins and minerals. Fish get omega-3 fatty acids from their diets, usually from fish oil in the pellets they eat. While fish oil is a source of heart health fatty acids, for both fish and humans, fish can get the same omega-3s from plants like algae. With this in mind Belov started TwoxSea. He was approached by Netscape co-founder William Foss who was disturbed by the collapse of the sardine fishery off the California coast in the 1950s. “The ocean has more or less been treated as an unlimited source of seafood and it’s not,” Foss said. Foss wanted to see if farmed fish could be raised on a sustainable diet. He called Belov who was working for SalmonAid, a non-profit promoting wild salmon conservation. They started TwoxSea after looking for aquaculture facilities that would replace fishmeal with alternative feeds like corn, soy and algae. “I started cold calling people from the California aquaculture list and called literally every farm and no one was willing to say yes,” said Foss. People were uneasy with testing a new diet and didn’t see the benefit if the sustainable feed cost more than fishmeal. “David McFarland was the only one who said yes,” he said. McFarland runs McFarland Springs Trout farm, based in Susanville, California. He was raising trout to stock rivers and lakes. The idea piqued his interest and after two years of testing the diet on a small scale and tweaking the ingredients he started feeding it to the fish. “I thought if we’re not doing it, who will?” McFarland said. He admits there are drawbacks to using an alternative diet, namely the cost. His pellets cost 90 cents more than traditional fishmeal, which can add up since feed is the largest fixed cost in aquaculture. 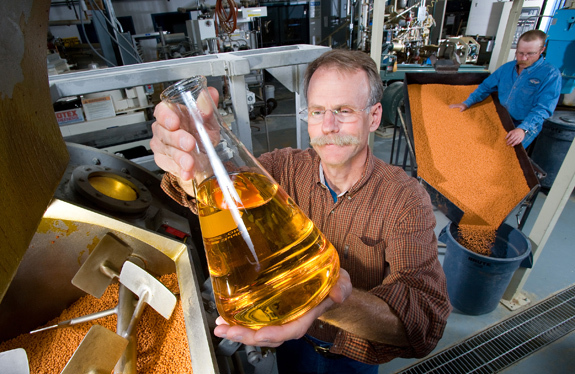 Rick Barrows, a research physiologist with the USDA, has tested more than 120 ingredients for fish pellets including the flax seed oil seen here. Photo courtesy USDA. “We’re not losing money but we’re not in this to get rich,” said McFarland. The trout farmer said his company is breaking even since the algae for the feed is more expensive than forage fish. He’d wanted to feed them spirulina, an algae often sold as a nutritional supplement at health food stores, but said that no company will sell it at a low price. “We thought biofuel companies would want in on the action,” McFarland said. Biofuels are fuels made from plants that can be used in place of petroleum-based fuels. There’s also the price to consumers. Belov says his fish costs more per pound than traditional farmed trout. It’s $1.50 more expensive than rainbow trout sold at grocery chains like Safeway. While McFarland Farms Trout is the only commercial aquaculture facility in the country using an entirely vegetarian diet, Barrows said it’s the future of aquaculture. “There is hope that we can have a growing aquaculture industry that is sustainable and we won’t have to rely on the ocean to get our fish” said Barrows. Cows were never raised on corn – – they are evolved to graze on grass. As Michael Pollan and others have eloquently demonstrated, feeding corn to cattle has made them (and us) sick. Feedlots generate disease, but they are efficient. So now the next brilliant idea is to feed corn to fish? No, thank you. couldn’t invasive species help with this? would making things like silver (jumping) carp from the Illinois river over for this use be viable? All this work to end up with something that is abnormal, unnatural, and unnecessary. Human beings can survive and thrive without eating fish. OMG, those McFarlane trout are delicious! The main species of fish and the bivalves (clams, oysters, scallop etc) that are farmed in the world are by nature vegetarian or omnivorous. Many of them are also the cheapest seafood on the market. It makes sense to me for several reasons, as a scientist that studies these matters, to grow and develop the market in the West for such species, rather than to force vegetarian diets on expensive carnivorous fish. threat to the longevity of wild pelagic stocks. In countries like Peru,fishmeal has become one their largest exports and an important fuel to their economy. While quotas for the capture of sardines and anchovies have been set, enforcement is difficult in the developing world and illegal sources of fishmeal are common. The United States has had a difficult time competing with international fish farmers, creating a worrisome seafood deficit worth well over $9 billion. In moving towards the next generation of farming, America is looking to create cleaner farmed fish by using advanced facilities and American feed products. New ingredients such as soy,corn, and even nut meal, have outperformed fishmeal in recent trials at the USDA. Further, by eliminating fishmeal and oil, toxic metals and external pollutants that bioaccumulate in forage fish can be eliminated. This opens the door for the potential to grow mercury-free fish. As a driver in sustainable farming practices, America is well positioned to create a specialty product, safer than current imports. Companies such as TwoxSea and McFarland Trout farms are not just utilizing vegetarian feeds, but also recirculating aquaculture systems to ensure the quality and safety of their products. The sheer mentality of this new generation of farmers is far ahead of the rest of developed and developing world. more likely to slowly begin a period of tapering and replacement of the commodity. While fishmeal is likely to be completely replaced, fish oil may continue to be utilized in low quantities due to its high vitamin, mineral and oil content. Simple economics of scale are likely to become a major hurdle in the replacement of fishmeal and fish oil. When the aquaculture industry begins to relinquish its necessity for fishmeal, the value of this commodity is likely to collapse, attracting new buyers. Industries that once used fishmeal, such as dog, cat and pork feed, but were outcompeted by the burgeoning aquaculture industry will likely take a second look at using the commodity once again. The fishmeal and fish oil paradigm is one that has haunted the industry for many years. Current alternatives cannot outcompete fishmeal for anywhere near the same price. As the American consumer become more educated, it will be interesting to see if the price premium placed on vegetarian fish can support itself. Caution is essential and honest consideration of risks to environment and to human health vital if vegetarian fish feeding includes GMO corn and soy. No mention of this factor in article, and if not using organic feed then food made from corn and soy is basically guaranteed to include GMOs and serious toxins. Explore how much pesticide these crops are exposed to. Explore what GMOs do to our digestive system and major organs. Do you want to eat fish that eat this stuff?